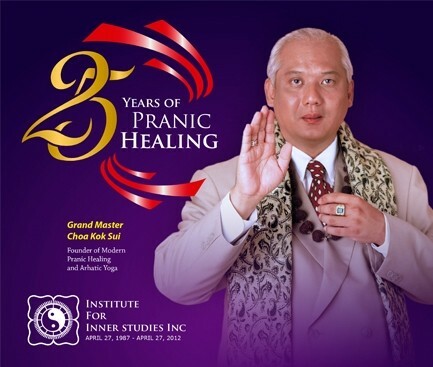 Pranic Healing® is a highly evolved and tested system of energy medicine developed by GrandMaster Choa Kok Sui that utilizes prana to balance, harmonize and transform the body's energy processes. Prana is a Sanskrit word that means life-force. This invisible vital energy keeps the body alive and maintains a state of good health. In acupuncture, the Chinese refer to this subtle energy as Chi. Pranic Healing® is a simple yet powerful & effective system of no-touch energy healing. It is based on the fundamental principles that the body is a self-repairing living entity that possesses the ability to heal itself and that the healing process is accelerated by increasing this life force that is readily available from the sun, air and ground to address physical & emotional imbalances. Master Choa Kok Sui says "Life Energy or prana is all around us. It is pervasive; we are actually in an ocean of Life Energy. Based on this principle, a healer can draw in Pranic Energy or Life Energy from the surroundings." Pranic Healing® requires no drugs, gadgets, not even physical contact with the subject. Physical contact is not required because the practitioner is working on the energy body and not directly on the physical body. This energy body, or aura, is the mold or blueprint that surrounds and interpenetrates the physical body. It is the energy body that absorbs life energy and distributes it throughout the physical body, to the muscles, organs, glands, etc. The reason Pranic Healing® works on the energy body is that physical ailments first appear as energetic disruptions in the aura before manifesting as problems in the physical body.